FIAT 850 COUPE POLITOYS M ART 517, MANCA MASCHERINA ANTERIORE, VERNICE DISCRETA, TARGHE PRESENTI NO BOX. You see what You get and buy. (Para 1 coche 1:43 - For One 1:43 model car). Voiture bicolore en très bon état,sans boite,made in Italie,année 1959. SOLIDO / 8168. Neb en Peugeot-Klassikern wie Typ 69 Bébé, 161 Quadrilette, RCZ, 104 106 107 108 201 202 204 205 206 207 208 301 302 304 305 306 307 308 401 402 403 404 405 406 407 408 504 505 508 601 604 605 607 806 807, Traveller, Bipper, Partner, Rifter, Expert, Boxer, D3 D4 J7 J9 sollte auch dieses Modell in keiner Sammlung fehlen. Model is in great condition. The model is still strapped. This is a lovely model and highly detailed. This is a lovely model and will add to your collection. Great detail and top quality. The box is in good condition too. It is made by AUTOart and is 1:43 scale (approx. 8cm / 3.1in long). 1/43 scale. HASTA 2000 gramos. HASTA 1000 gramos. HASTA 500 gramos. RESTO de PAÍSES. 1:18 W124 Mercedes E320 Coupe by Otto. Sealed resin model. Brand new, in original unopened packaging. Your package will be dispatched within 24 hours of payment being received. 1963 MASERATI MISTRAL COUPE. 1:43 SCALE. Dinky Toys No: 182 Porsche 356A Coupe.. en Caja Y En Perfecto Estado Original. Dinky Toys No: 182 PORSCHE 356A COUPE....1958-1966 Boxed and in mint original condition. This was purchased by me from new and has been boxed and carefully stored over the years. It has rarely been out of its box! ROLLS ROYCE CORNICHE DROPHEAD COUPÉ EN 1:43 DE POLISTIL. CONSULTAR GASTOS DE ENVIO ( RESTO DEL MUNDO ). Sku: 31890. Età consigliata: 3 . Confezionata in scatola vetrina speciale con basetta nera. Rio # 9 ech1:43. belle Isotta-Fraschini 8A coupé de ville 1924. Possible sending to world. Die Sicherungsbänder wurden für die Fotos entfernt. Das Modell wird sehr gut neu gesichert. REVELL /AUDI-Dealer-Modell. COUPÉ / 8N / 1998. Zustand/Condition: SEHR GUT, neuwertig, Modell wurde überwiegend in der Box aufbewahrt. Kyosho BMW M3 E92 Coupe Rot. Sehr seltenes und Rares Modell ohne Mängel. Neu und OVP. Sehr detailgetreues Modell. Ohne Gewährleistung! Ohne Schadenersatz! Je nach Zone auch verschiedene Preise. Vorbild/Original: Cisitalia DF85 Coupe Fissore. Farbe/Color: blau / blue. Sie gehen zu Lasten des Käufers. Beachten Sie die Altersempfehlung 15 / The product is not suitable for children under 3 years because of sharp edges or breaking off of small parts. NOREV FRANCE. Réf Norev : 73. (Miniature boite). Référence : 73. Avec présence de la petite pastille de la coupe d'Or du bon gout Français sur le mica. Coupe d'Or du Bon Gout Français. Made in France. FABRICANTE: IXO DEAGOSTINI. REST OF WORLD. MANUFACTURER: ALTAYA. MODEL: DB4. MAKE: ASTON MARTIN. MATERIAL: DIECAST. COLOUR: GREEN. SCALE: 1:43. OPENINGS: NO. Coche nuevo a estrenar de la colección OPEL COLLECTION de ALTAYA. Es un COMMODORE A COUPE. OPEL COLLECTION. 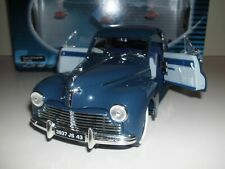 diecast guisval joal pilen matchbox french car. ENGLISH SPOKEN. PORSCHE 356 B coupé 1961 avec socle en bois en bon état et boite état moyen. Model number TSM124369. Scale 1/43rd. This is a model of an open 1961 Rolls-Royce Silver Cloud II Drophead Coupe. The model is finished in black with a beige folded roof and a beige interior. It features an excellent amount of detail including white wall tyres and a gold coach-line. Ford Usa Gran Torino Coupe 1976 Starsky & Hutch Red GREENLIGHT 1:43 GREEN86442. Seit über 10 Jahren sind wir der kompetente Partner aller engagierten Modellsammler. .6,3l V12 Flügeltürer/Gullwing. Zustand/Condition: GUT, ein gepflegtes Vitrinen-Modell dieses Supersportwagen-Goldstücks. Mängel/Defects: NEIN, habe keine offensichtlichen Mängel gefunden. S ehen Sie die Bilder an ! Original Audi Modellauto. Farbe: Magnetic Blue Blau. Audi R8 e-tron Coupe. Poids : 2,5 kg avec sa boite de protection. Modèle rare. SEAT IBIZA SPORTCOUPE. Coche escala 1/43 de la colección Seat Collection. Nuevo en su blister original sin abrir. Incluye fascículo en buen estado. 1/43 Audi TT COUPE BLUE. El estado es Nuevo. Enviado con Correos: cartas certificadas. AUTHENTIQUE NOREV EN BOITE PROMOTIONNELLE RENAULT. NEUVE EN BOITE. ÉTAT DE LA BOITE :A. COTATION : A = état neuf. C = état moyen. B =bon état. DINKY 24F 'SPORTSMANS COUPE'. GREEN & BLACK. Needs a re paint and new headlight. Marke Ricko. Nuevo y sin uso. Camioneta/auto camioneta. Maserati 4200GT Coupe Cambiocorsa. IXO 00; 2002 Maserati Coupe; Dark Blue. SIMCA C.G 1300 Coupé 1973. Neuve dans sa boite d'origine. autres modèles français proposés dans les semaines a venir. Autres photos dispo.